When you're a wildlife photographer working in a public park, the equipment you use undoubtedly draws attention. 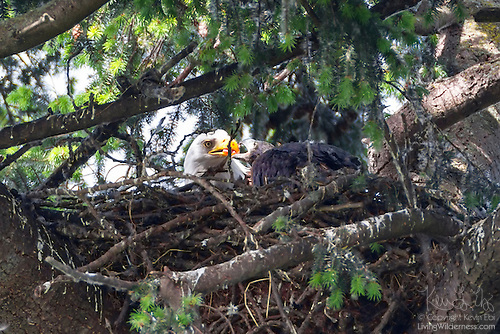 This summer, I've been documenting the development of a pair of young bald eagles. To get the images I need without disturbing the birds, I've been using a 600mm lens – a 13-pound monster of a lens that has a front element only slightly smaller than a dinner plate. A small number of people come up and ask me questions about the birds. Many, many more grill me about my equipment. The vast majority say something like, "I bet you can see every nose hair with that." I cannot. In terms of magnification, the lens falls in between a pair of binoculars and a birder's spotting scope. The lens is physically big because it lets a lot of light in allowing me to capture action images at high resolution. It's the second most common question that I'm going to address in this blog post. It comes from amateur photographers who want to know about my use of a teleconverter with this lens.